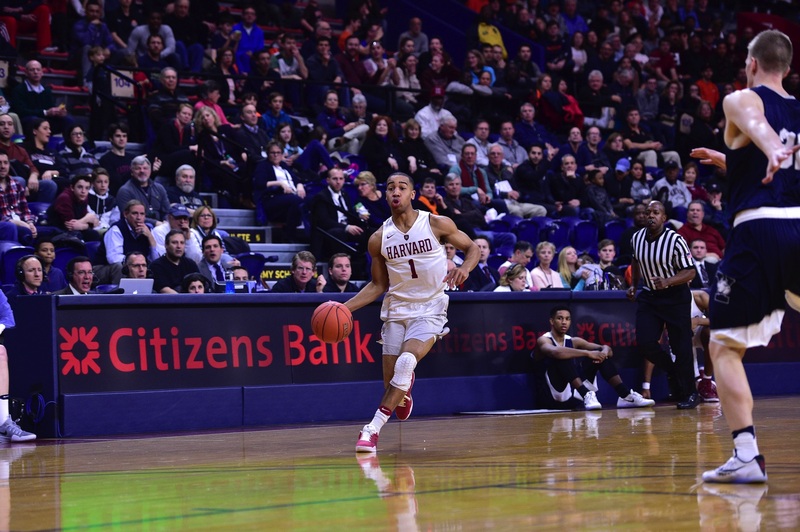 Siyani Chambers '16 ('17) had five assists and just one turnover in the men's basketball team's loss to Yale in the Ivy League tournament semifinals. Bryce Aiken '20 led the Crimson with 28 points against the Bulldogs and was named to the all-tournament team. On Saturday evening, the mood in the Harvard men’s basketball locker room was somber. The team had just lost 73-71 to Yale in the Ivy League tournament semifinals, and senior co-captain Siyani Chambers slumped against a locker, a hand on his head. The team’s jerseys were stacked in the center of the room, and a pair of reporters lingered as the players slowly packed their belongings. One asked how the Bulldogs—a team the Crimson had beaten comfortably in two previous meetings—had upended the Crimson when it mattered most. “Sometimes the ball doesn’t go in,” offered senior guard Matt Fraschilla, “and today was one of those days.” Harvard shot 35 percent from the field and 25 percent from three-point range. Both teams left Philadelphia stunned by their early exits from the tournament. By that standard, the Crimson succeeded. Harvard committed just five turnovers—the fewest in a game this season. Unfortunately, one of those was pivotal. With just under 10 seconds remaining and the Crimson trailing by three, Chambers tried to pass the ball to Bryce Aiken ’20—and the Bulldogs read the pass. Aiken, after all, led the Crimson with 28 points. “I’m pretty sure everyone on the floor knew Bryce was getting the ball,” said Yale freshman Jordan Bruner, who made the steal. That mistake was symptomatic of a big problem: with Chambers, Seth Towns ’20, and Corey Johnson ’19 shooting poorly—a combined four of 30 from the field—the offense ran almost exclusively through Aiken, who accounted for nearly a third of the Crimson’s 77 field goal attempts. Amaker likes his team to employ a balanced attack, but, on Saturday, the team was forced to become one-dimensional. Harvard also struggled to defend the paint. 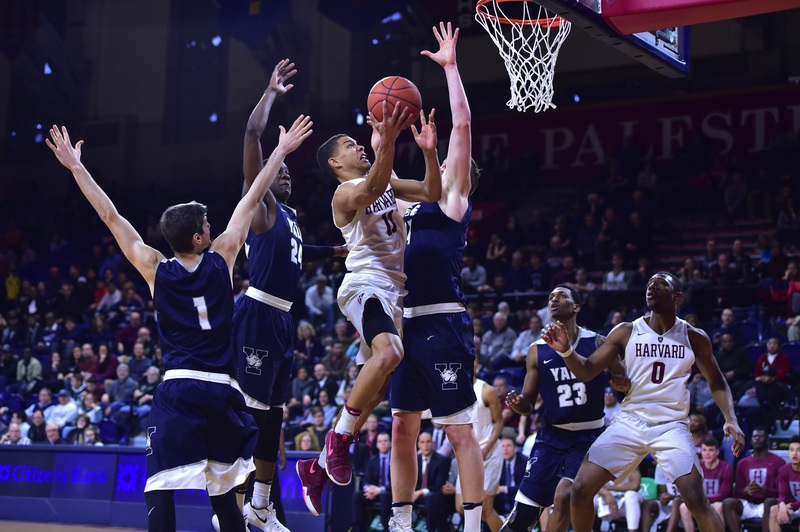 That’s partly because the team has lacked an elite perimeter defender, partly because of Yale’s strong frontline, and partly because of the difficulties Harvard has had all year playing strong team defense. A case in point: with just over a minute and a half remaining, the Bulldogs were leading 68-66, and Yale freshman Miye Oni had the ball on the perimeter. Matched-up against Justin Bassey ’20, Oni made his move. Bassey could not stop the drive, and help never came. Oni threw down a ferocious dunk and drew the foul. The ensuing free throw gave the Bulldogs a five-point lead and forced the Crimson to depend unsuccessfully on Aiken’s heroics. On Wednesday, while Amaker was discussing the importance of minimizing mistakes, Delaney-Smith was on the Lavietes Pavilion floor, along with two of her assistants, working with freshman forward Jeannie Boehm on her post moves. One of the coach’s top priorities for the week was to improve the team’s frontline shooting. In the 64-46 loss to Penn in the regular season finale, Boehm and fellow starting forward Destiny Nunley made just eight of 21 shots, and Boehm had taken only four. Senior co-captain Destiny Nunley, an All-Ivy honorable mention honoree, and her teammates struggled to contain the Tigers in a 21-point loss to Princeton in the Ivy League tournament semifinals. Freshman Katie Benzan was named to the All-Ivy first team and said that she wants to use the Crimson's loss to the Tigers as motivation for next year. The teams’ short stays in the tournament were disappointing, but each has a talented nucleus returning next year. The men’s team started four freshmen on Saturday, and two—Aiken and Seth Towns—were the Crimson’s top scorers this season. Similarly, the women’s team relies on a young core of Benzan, Boehm, Raster, and sophomore guard Sydney Skinner. But both teams will need to learn from this year’s early exits. After Saturday’s game, Amaker noted that a team sometimes needs to have its “hearts broken a few times.” That can help young players appreciate the effort and sacrifice needed to win a conference championship. Similarly, Benzan planned to take just one day off before returning to the gym to practice. She does not want to relive the feeling, she said, of Saturday’s loss. Ivy League basketball is as strong as its been in the modern era. Several of the men’s teams (Cornell, Harvard, and Yale) have recently won NCAA tournament games. The women’s conference has the eighth-highest RPI (the Ratings Percentage Index uses teams’ records and the difficulty of their schedules to measure a team or league’s strength) in the country, just behind the Big East, one of the most prominent conferences in college basketball. The introduction of the Ivy League basketball tournaments is not just a one-off event; it is a continuation of a broader metamorphosis that has made the conference more competitive and nationally relevant. The stakes have risen, and if Harvard wants to win again, it will need to respond. Tidbits: Earlier in the week, the Ivy League announced the all-conference teams. On the men’s side, Bryce Aiken was the conference’s rookie of the year and a first-team All-Ivy honoree; Chambers also made the All-Ivy first team. From the women’s team, Katie Benzan made the All-Ivy first team, and Destiny Nunley was an All-Ivy honorable mention designee. The Princeton men’s team and Penn women’s team captured the Ivy League tournament championships. On Sunday, the Tigers learned that they will face Notre Dame in the opening round of the NCAA tournament in Buffalo; the Quakers will receive their first-round opponent and destination on Monday.